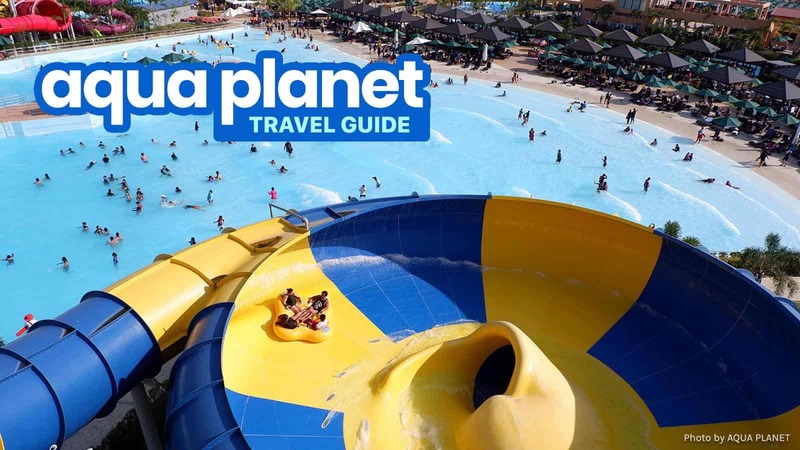 Welcome to our AQUA PLANET TRAVEL GUIDE. 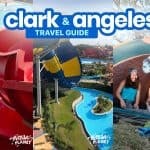 This article contains information about this Clark theme park including directions, entrance ticket prices, operating hours, best rides, and other tips! Enjoy! Summer break was something I looked forward to when I was a kid. It’s a time when my cousins and I would excitedly squeeze ourselves inside a hired jeepney to travel to nearby popular beach destinations or resort villages. But while we were still waiting, we would set up our own makeshift “water park” with only laundry wash basins for the pools and washboards for the slides. Still, we had a grand time. 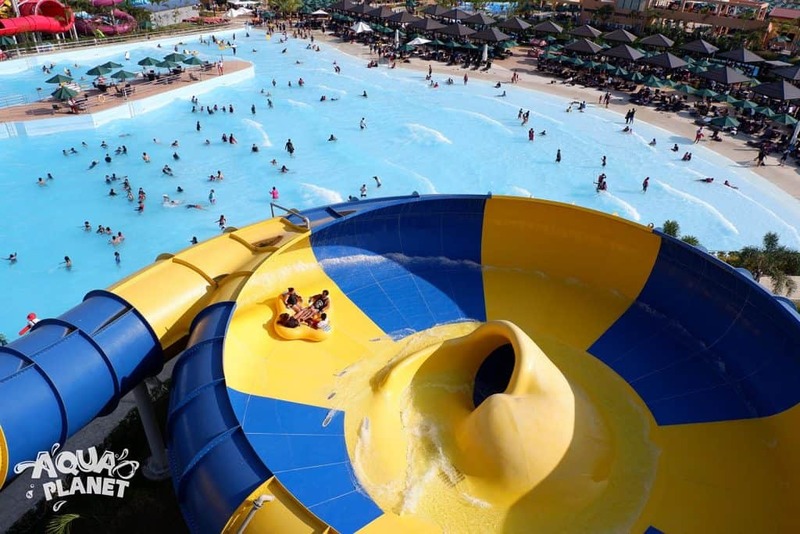 At present, the country is home to several water parks, which feature unique and incredible attractions. I’ve been to one in the south when I was a kid, and I immensely enjoyed my time there. February 24, 2018. Aqua Planet officially started its operations. 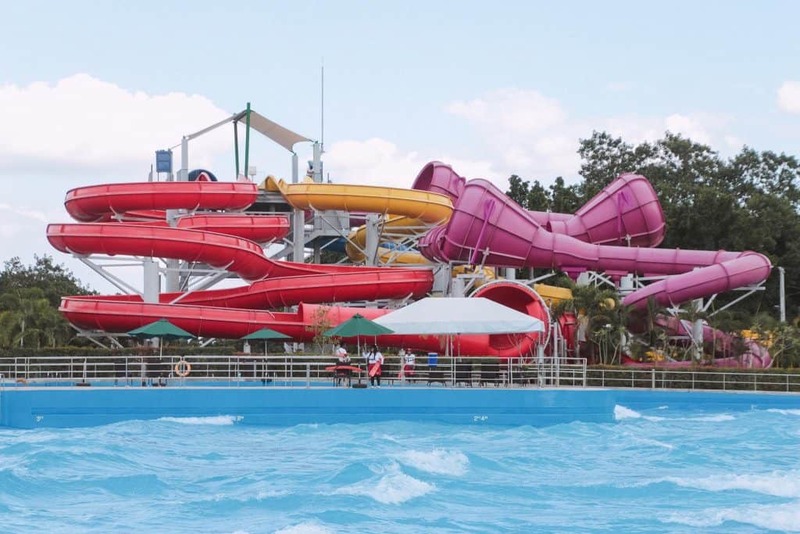 This 10-hectare water theme park is just the first wave of development for a 122-hectare resort project inside Clark Freeport Zone. Themed Areas. The Kiddie Zone and The Zone 1. Aqua Planet Characters. Also called the Aqua Planet Legends, these are the water park’s mascots: Captain Aqua, Mermaid Princess, Orc, King King Penguin, and The Bubblies namely Bellow, Snug, Quince, and Snout. Brand Values. SAFETY first and foremost, FUN for all, and QUALITY service and experience. Here are some of the things you might want to know before you go. What are the operating hours of Aqua Planet? 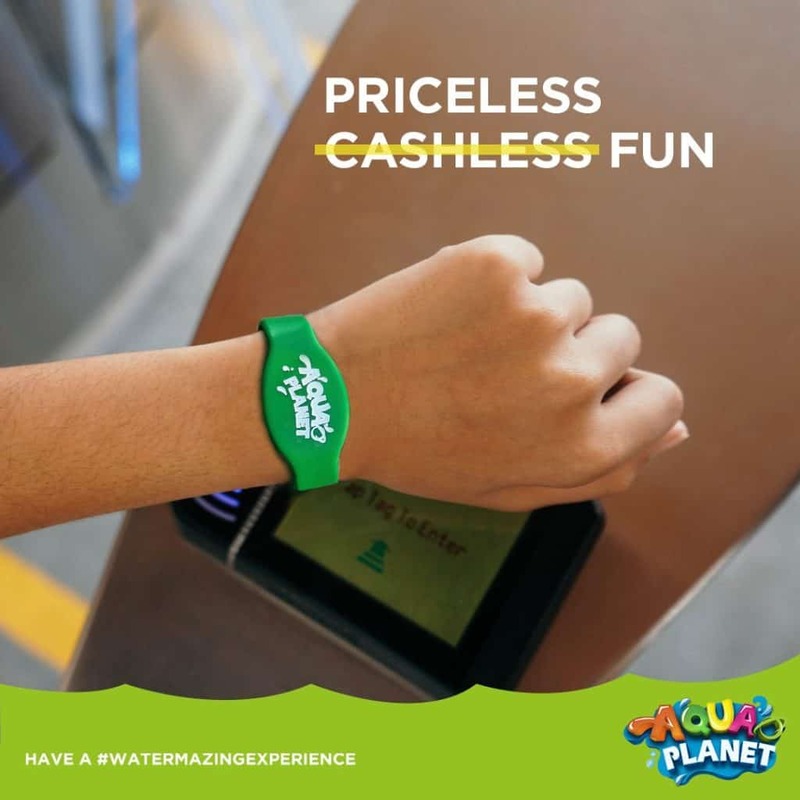 How much is the Aqua Planet admission ticket? 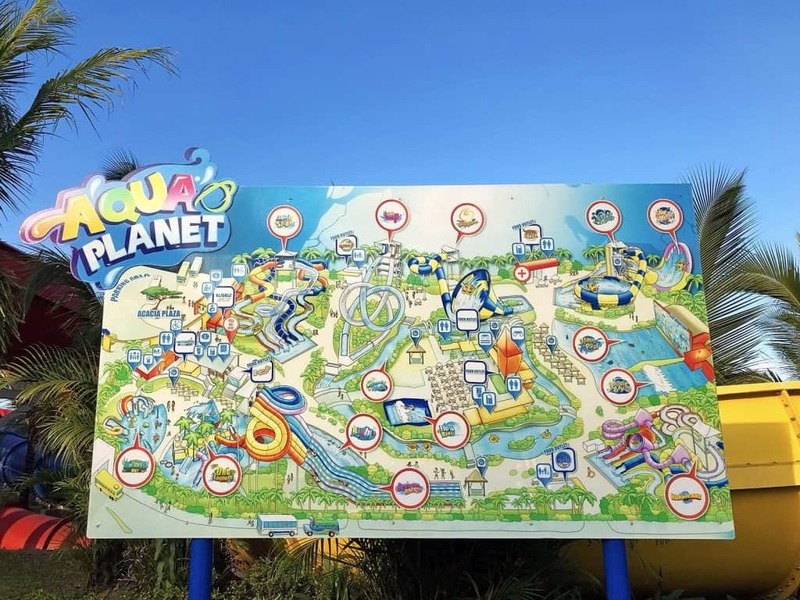 How to get to Aqua Planet from Manila? What are the the attractions? Are there other lounge facilities aside from tables and chairs? 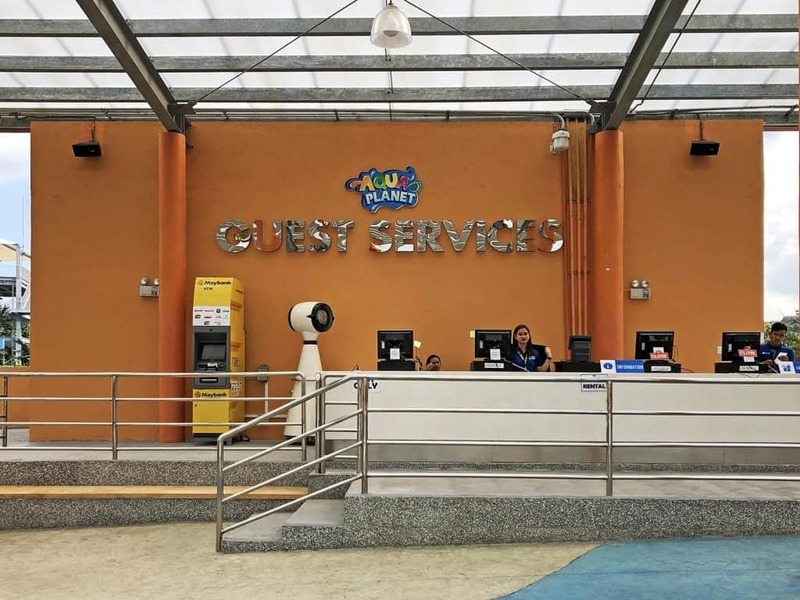 How do I pay for food and other services inside the park? 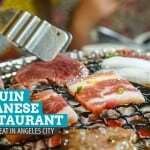 Where to eat inside Aqua Planet? Are there lockers inside Aqua Planet? Are pets allowed inside Aqua Planet? Aside from food and pets, what else are not allowed inside the park? Are the slides and attractions safe? What are the other safety restrictions? Aqua Planet operates daily from 9:00 AM to 5:00 PM. 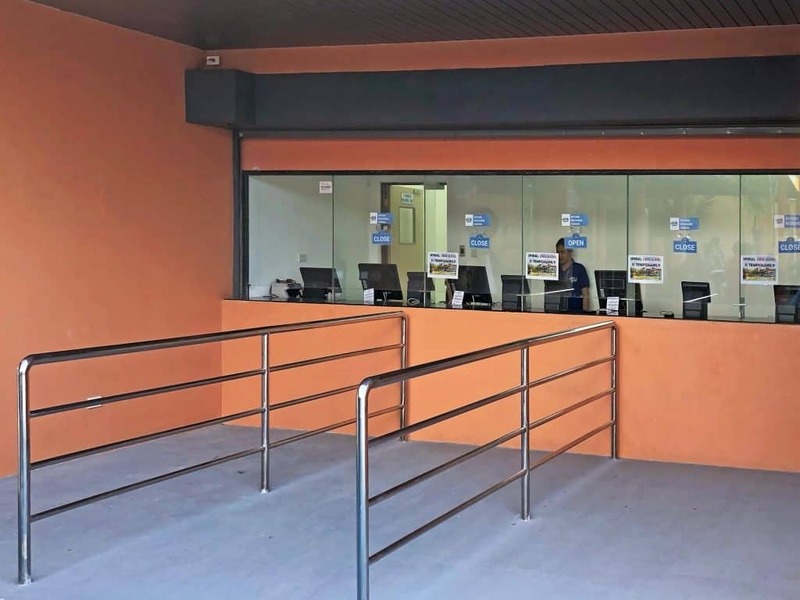 The management has the right to alter the schedule depending on the weather condition, maintenance schedule, and blocked dates for special occasions. Always check the schedule before going to the park. You may reach the management at (045) 649-8500. There are two kinds of ticket rates and two types of admission tickets. The two kinds of ticket rates are the weekday rates and weekend rates. The two types of admission tickets are the Slide & Soak ticket for adults/4ft and above and the Drop & Splash ticket for kids/below 4ft. Admission fee for infants is waived. 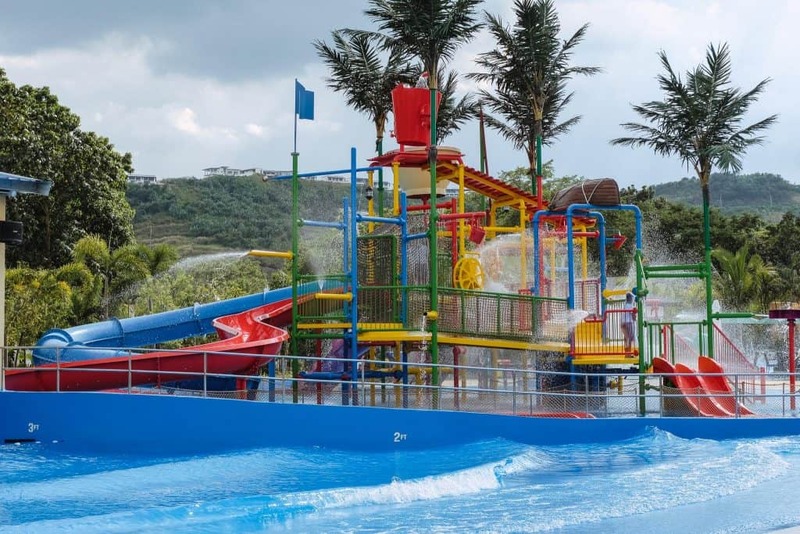 All ticket rates are inclusive of the entrance fee, all-access pass to all water rides and attractions, tables and chairs (first come, first serve basis), flotation gear/devices, and use of Wi-Fi. Upon purchase of tickets, you will be given the RFID wristband called “Planet Band” instead of a single-use wristband. This will be your one-time entry and exit pass. Note that re-entry is not allowed, so make sure you don’t forget anything inside your car. You can get your tickets at the ticket booths situated at the gate of the water park. You can also book in advance online via Klook! For group sales (company outing, teambuilding, family gathering, school tours, and other ocassions), you may inquire here. Obviously, weekdays are less crowded than weekends. We went on a Monday, so we got to repeatedly experience our favorite slides and attractions as there were no long queues. The busiest days are weekends and during the holidays, especially summer and school breaks. The weekend is a rest day and family day for most of us, so expect more people and long queues. Clark International Airport is the main gateway to Clark and other Central Luzon areas and is the secondary gateway to Manila after NAIA. 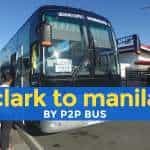 But land travel to Clark is made easier and convenient by North Luzon Expressway (NLEX) and Subic-Clark-Tarlac Expressway (SCTEX). You can skip the plane and just drive or commute there for two to three hours, depending on the traffic condition. Coming from Subic Bay, it only takes about 45 minutes via SCTEX. 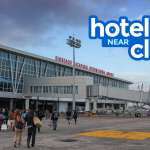 The nearby landmarks are Clark International Airport (10 minutes), SM Clark (15 minutes), and Angeles Heritage Plaza (20 minutes). Many buses operate between Manila and North Luzon daily. 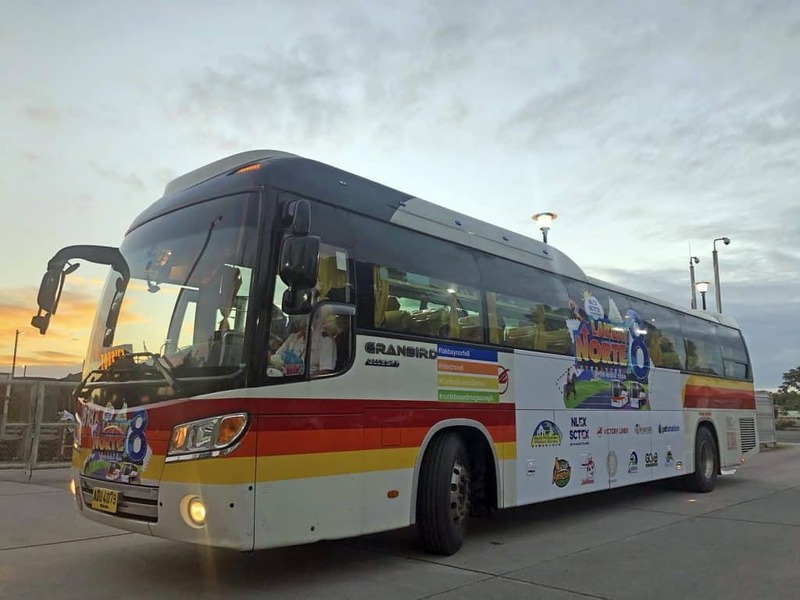 One of the trusted bus companies when traveling to the north is Victory Liner. It has bus terminals in Pasay and Cubao. Take a bus from either Cubao or Pasay terminal and alight at Dau-Mabalacat Bus Terminal. From there, you book a Grab to Aqua Planet. The total fare is P300-350 and travel time is approximately three hours. Alternatively, you can take the P2P bus offered by Genesis. Pick up is from Trinoma and alight at SM Clark. Travel to Bayanihan Terminal on foot. Board the Blue Jeep to Aqua Planet. Via NLEX. Take Dau Exit. Take the direction going to Angeles until you reach the road signage pointing to Clark. 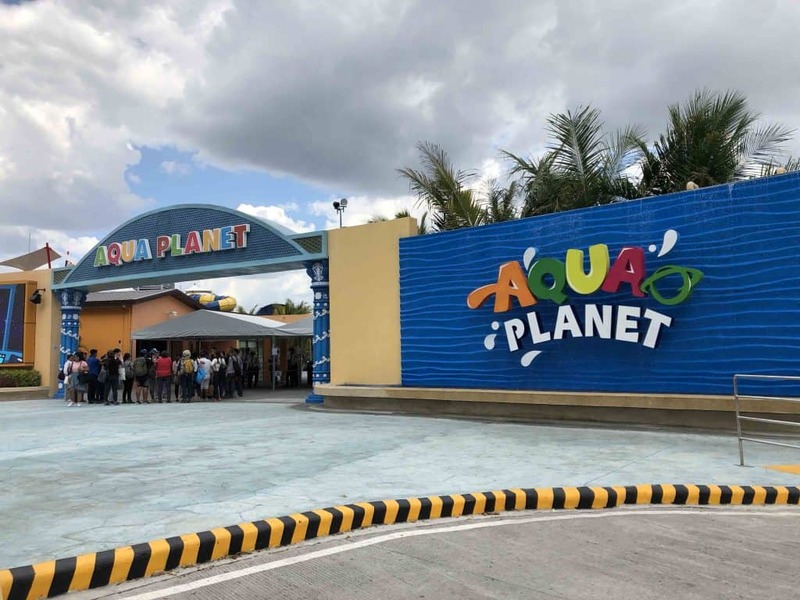 Aqua Planet is located at the northwestern portion of Clark Freeport Zone (CFZ). 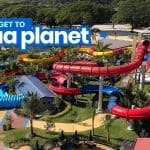 Aqua Planet has about 38 slides and attractions. They are classified into two categories: Kiddie Zone and Zone 1 (for 4ft and above). Mermaid Bay. It’s a water playground with different fun slides, sprinklers, and exciting characters. Water depth is 0-14 inches. Orc Lagoon. Another water playground with water cannons, wheels, ropes, and giant water bucket! Water depth is 0-12 inches. Bubble Base: Kiddie Wave Pool. The first in the country! There are three kinds of waves: diamond, roller, and stretch roller. Water depth is 0-44 inches. Only children under 4ft or 47 inches are allowed. Maximum weight allowed to use the slide is up to 200 lbs or 90.72kg. For the kiddie wave pool, children below 4ft must wear life jackets. All children must be accompanied by a guardian or an adult. Spiral Slides. This attraction has four tubes with varying twists and turns. Water landing depth is 0-14 inches. Two riders at a time. Type of floater: Double Tubes. Spiral Slides. Photo provided by Aqua Planet. Octopus Racers. Race with your family and friends through the six colorful slides. Water landing depth is five inches. Minimum height requirement is 4ft. One rider at a time. Type of floater: Race Mat. Aqua Loop. Dare to slide in a standing position and drop 100-meter into the 360-degree loop. You have two slide options — the blue one or the red one. This is the most extreme ride in Aqua Planet. Water landing depth is five inches. Minimum height requirement is 5ft. No floater needed. One person at a time. Hurricane Slides. This is a more extreme version of Spiral Slides. Water landing depth is three feet. Minimum height requirement is 4ft. Two riders at a time. Type of floater: Double Tubes. Super Bowl. Slide into a wide bowl, swinging from side to side before you splash down into the three-foot-deep water. Minimum height requirement is 4ft. Four riders at a time with not more than 660 lbs or 299.37kg combined weight. Type of floater: Quad Tubes. Sky Shuttle. This attraction will shoot you up a steep slide feature and will leave you feeling weightless as you slide back down. Water landing depth is three feet. Minimum height requirement is 4ft. Four riders at a time with not more than 660 lbs or 299.37kg combined weight. Type of floater: Quad Tubes. Tornado. My most favorite attraction! Be swept into the gigantic funnel and scream your heart out with three of your friends. Water landing depth is 3ft. Minimum height requirement is 4ft. Four riders at a time with not more than 792 lbs combined weight. Type of floater: Quad Tubes. Flow Rider. This simulates waves good for surfing. Test your skills in balancing yourself on a board and ride the waves. Surf’s up! Minimum height requirement is 4ft, while the minimum weight required is 200 lbs or 90.72kg. Type of floater: Flow Rider Board. Wave Pool. This 3500-sqm pool boasts eight types of waves that will surely give you and your companions a #wavetasticexperience! Water depth is up to 5ft and nine inches. Boogie Bay. Located just beside Wave Pool, this 1500-sqm pool can give you a taste of how it is to ride the waves and beat the current. This is a more extreme version of Wave Pool. Water depth is up to 8ft and eight inches. Minimum height requirement is 4ft, while the minimum weight required is 200 lbs or 90.72kg. Type of floater: Flow Rider Board. Wave River. Chill and let the gentle current sweep you away and around Aqua Planet. Water depth is up to 3ft and seven inches. Type of Floater: Single Tube. Slide maximum weight requirement is 200 lbs or 90.72kg. 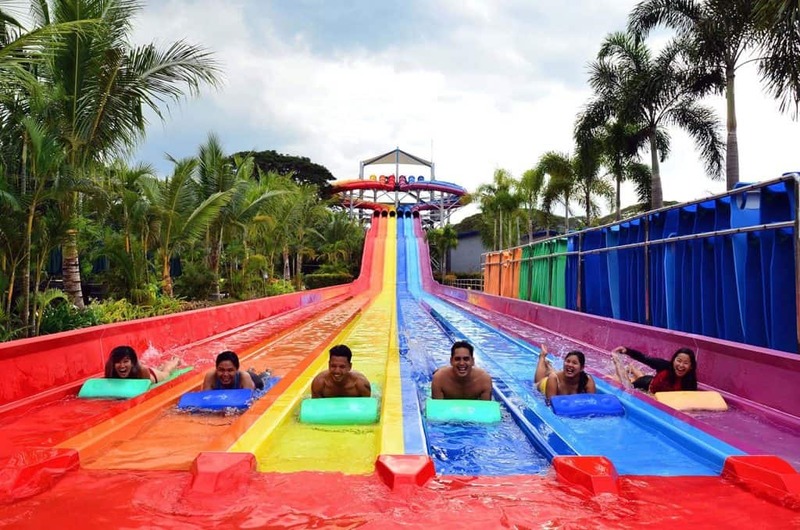 Guests who will not meet the weight requirement (maximum 200lbs or 90.72kg) for the slides will get a FREE merchandise voucher worth PHP100. The voucher is only valid on the day of the visit. Octopus Racers, Super Bowl, and Sky Shuttle have minimum weight requirement of 88 lbs or 39.92kg, while Aqua Loop has 100 lbs or 45.36kg. 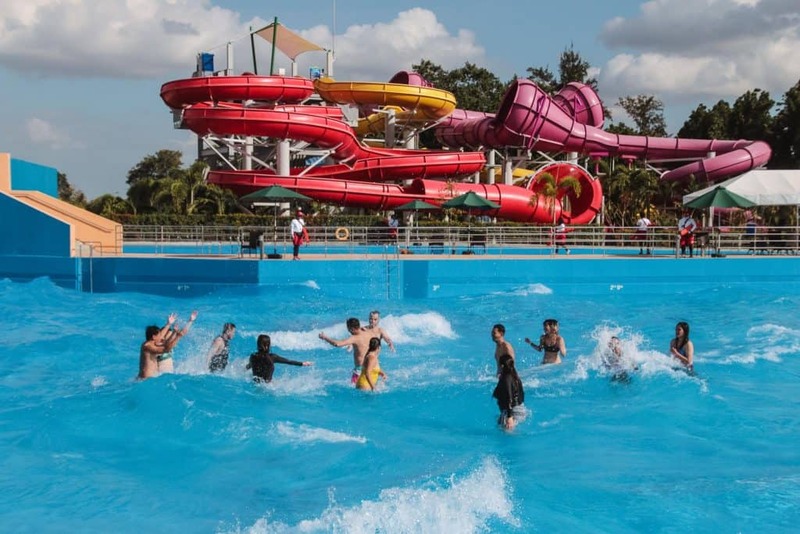 For Wave Pool and Wave River attractions, life jackets are required for children under 4ft and those who can’t swim well. All children below 4ft must always be accompanied by a guardian or an adult. Expect long queues, especially during peak season. This will depend on the time of your visit and the attraction. For the popular attractions, it may take you 30 minutes to over an hour during peak season and weekends. On weekends and in peak seasons, expect to wait in line for a long time for everything — rides, food, and restroom. Prioritize. Decide on the attractions that you don’t want to miss. List and rank them. After covering your priority rides/attractions, you can move on to the others if you still have time. Go there early. There’s not too much crowd yet, so will have more time at the park and will have a higher chance to try all your favorite attractions. Take a brunch. This will save you more time by avoiding waiting in line for your food. Remember to hydrate yourself though. Yes! If your group/family is big or wants a bit of privacy, you can rent cabanas. Remember that this is exclusive of your admission ticket. The cabana rental rates range from P3000 – P5000 (good for 15-25 pax). Each cabana has comfortable cushions, mist fan, and safety box/vault for your valuables. Rental Counter near the Entrance/Exit gate. Upon ticket purchase, you will be given the Planet Band, the RFID wristband that serves as your entry and exit pass too. It also serves as your e-wallet. Use it to buy food and other products inside Aqua Planet. Load it at the Refill/Refund Station near the entrance and around the park. Note that loading must be done via cash as credit cards are not accepted. You can use the credit card when you purchase the admission tickets. If you haven’t used everything up, you can refund your cash at the Refill/Refund Station also. You need to return the Planet Band upon exit. Don’t lose it or you’ll pay for the unit. Food and drinks from outside are NOT allowed inside the park. Exceptions are medical and infant food. YES! There’s a Maybank ATM beside the Guest Service counter. YES. You can activate a unit using your RFID wristband, Planet Band. 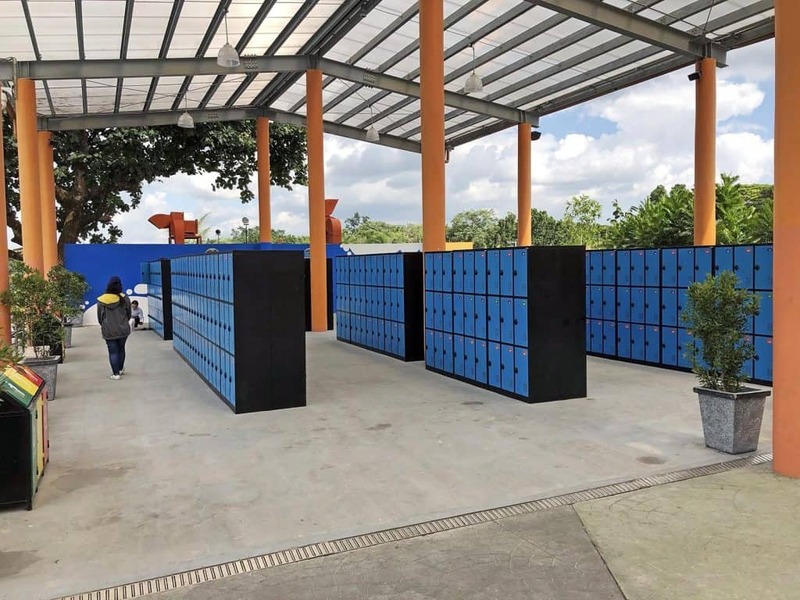 Lockers are located near the Guest Service area. Upon entering the park, you can immediately spot it on the right side. The rental rate is P200. NO. Only certified service animals are allowed. Wheeled devices/carriers EXCEPT for wheelchairs and strollers for infants, senior citizens, and PWDs. 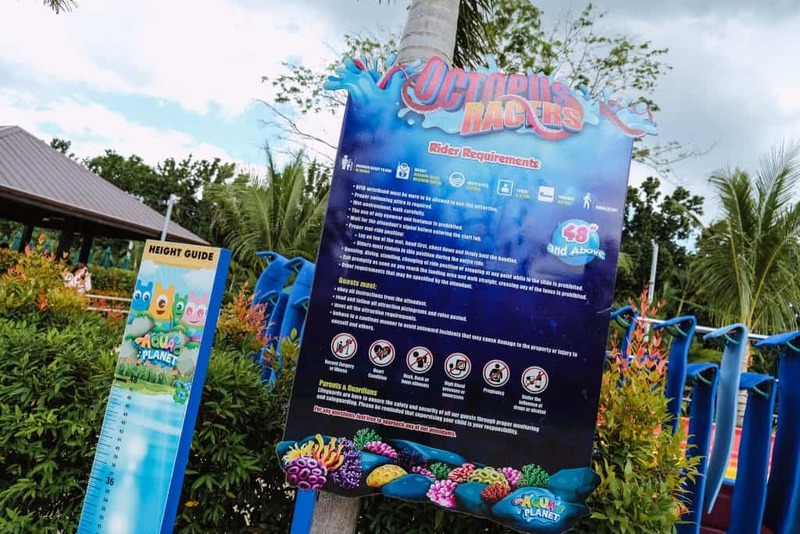 Aqua Planet management made sure that every ride is safe and in good condition. Height and weight requirements are strictly implemented to ensure the safety of everyone. The staff members are highly trained and the majority of them are skillful lifeguards. 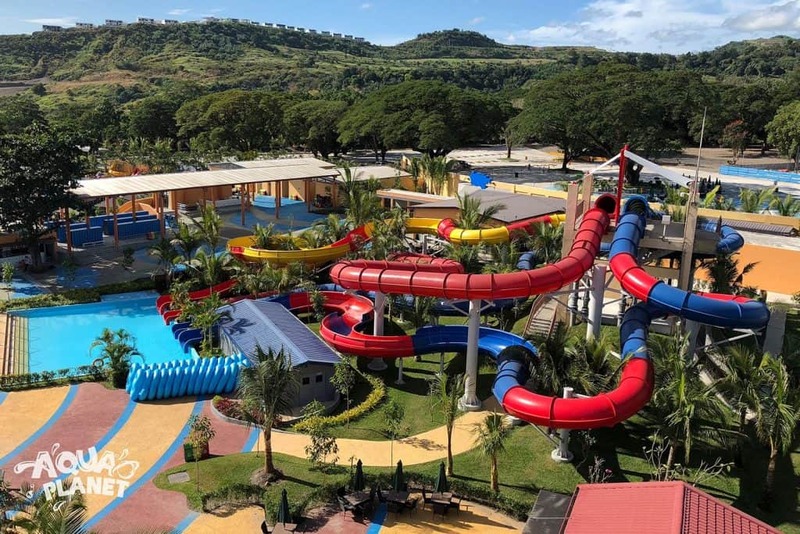 The quality of water is also a top priority as the park houses four state-of-the-art filtration systems, providing safe and clean water running inside the water park. Some items are not allowed when using the slides. Refrain from bringing or using them if you don’t have anyone to look after your stuff. These items are not allowed: eyeglasses, jewelry, denim, swimwear with metal materials, footwear (except aqua shoes), and gadgets such as phone, camera, action cameras, and selfie stick. Take good care of your Planet Band. You will be charged for it. Secure your belongings at all times. You are responsible and accountable for any loss and damage. Hi there! Thanks for the very informative blog. I ‘d just like to know regarding the proper swim attire; do they allow wearing 2 piece or one piece swimsuits? It’s just that most patron pics show people wearing rash guard and shorts. Also, are there any restaurants/eateries that you can recommend near Aqua Planet that we can go to for dinner. Thanks again! Hi! You can wear two-piece bikini or one-piece swimwear, as well as rash guards. 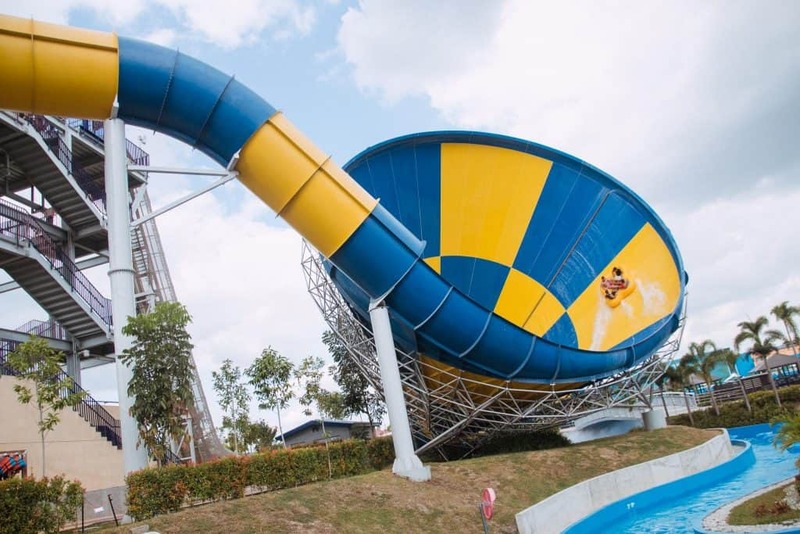 What they don’t allow are those swimwear with metals on them (studs or those with belt designs) as these will damage the slides or the floaters. 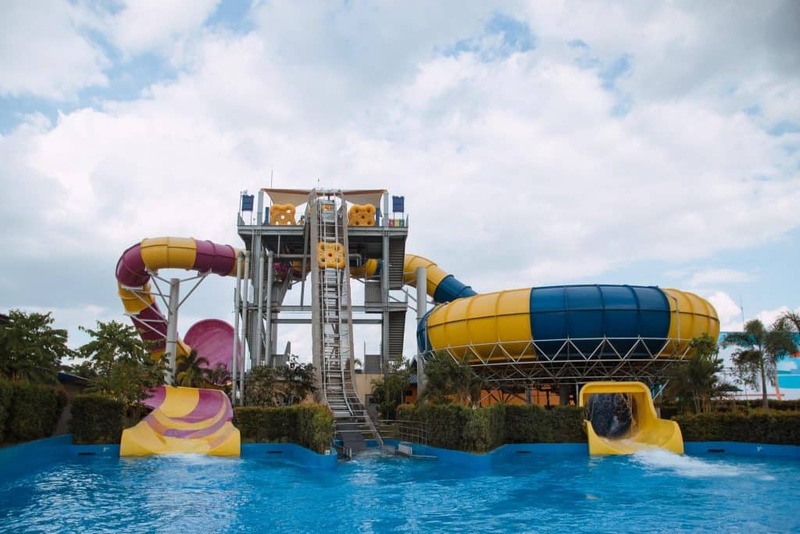 If you wanna try the vertical drop slide, the Aqua Loop, and Flow Rider, you need to make sure that your swimwear is the kind that won’t easily rip to avoid wardrobe malfunction.